Zeaxanthin is a naturally occurring carotenoid, which is a pigment that is responsible for the bright colors of some fruits and vegetables. It is found in high concentration in kale, spinach, mustard and turnip greens and other leafy green vegetables. The highest concentration is found in goji berries. Like other potent antioxidants, zeaxanthin minimizes phototoxic stress in the eye and the body. Humans do not produce carotenoids so they must be consumed. Zeaxanthin and lutein are both present in the crystalline lens of the eye where cataracts are formed. Oxidative stress is thought to be a cause of cataracts and zeaxanthin (as well as lutein) may play a protective role in slowing or preventing the development of cataracts as shown by some research studies. The highest level of oxidative stress in the body occurs in the macula (central retina) of the eye. The only carotenoids found in the macula are lutein and zeaxanthin. They are the primary component of macular pigment. Although both of these important antioxidants are in high concentration in the macula, zeaxanthin is concentrated higher than lutein in the central fovea (the center of the macula). Macular pigment protects a very important layer of the retina, the retinal pigment epithelium, by absorbing excess light and eliminating free radicals and consequently their damaging effect. Studies show that a higher level of macular pigment results in lower amounts of macular degeneration. It is also believed that higher amounts of macular pigment may also improve vision (specifically contrast sensitivity) and reduce glare and light sensitivity. While evidence tends to support the statements above, some of the studies have been inconsistent. A very large study (Age Related Eye Disease Study "AREDS 2") is currently underway that may bring the role of zeaxanthin and lutein into better focus. There are currently no United States Recommended Daily Allowance guidelines for zeaxanthin. It is considered relatively safe and is listed in the guidelines with other supplements having no observed adverse levels. A minimum of 2 mg per day of Zeaxanthin is needed. 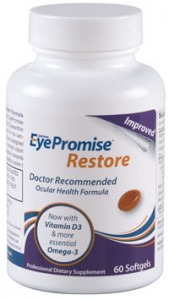 For patients with macular degeneration risk factors or those already diagnosed with macular degeneration we recommend Eye Promise Restore. If you have five or more of the above risk factors we recommend two EyePromise Restore softgels per day for six months. Then one softgel per day everyday thereafter unless the QuantifEye MPOD test reveals a need for more or less.